1. Heat oven to 400°F. Spray 18x13-inch rimmed sheet pan with cooking spray. Place 12x10-inch piece of foil in centre of pan. 2. In large bowl, mix 2 tablespoons of the butter, the garlic and 1/4 teaspoon of the pepper. Make 12 thin cuts in ham, leaving bottom 1/2 inch uncut. Place one halved slice of cheese in each cut. Brush ham all over with butter mixture. Place on foil in centre of pan. 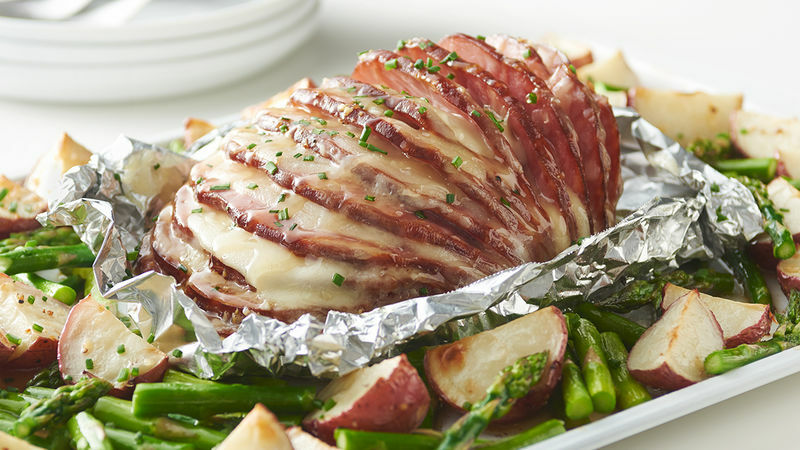 Pull up all four sides of foil around ham. Cover ham tightly with another piece of foil. Roast 18 minutes. 3. In same large bowl, mix 1 tablespoon of the butter, the salt and remaining 1/4 teaspoon pepper. Add potatoes; toss to coat. Place potatoes skin sides down in single layer in pan around ham. Roast 26 to 30 minutes or until tender when pierced with knife. Remove from oven; stir. 4. Add asparagus and remaining 1 tablespoon butter to same bowl, and toss to coat; arrange in single layer in pan next to potatoes. Roast 12 to 15 minutes longer or until ham is heated through (140°F), potatoes are browned and fork-tender, and asparagus is tender. Remove foil from top of ham, and drizzle with honey. Sprinkle chives over entire pan. Spoon juices from ham over ham slices when serving. If some potatoes are larger, cut in 6 pieces so all of the pieces are similar in size. Be sure to distribute the garlic evenly among the slices before baking.